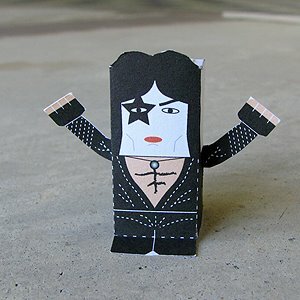 This paper toy is Paul Stanley, the papercrafts is designed by Toy a Day. Stanley Harvey Eisen, better known by his stage name Paul Stanley, is an American hard rock guitarist, singer, musician, painter and songwriter best known for being the rhythm guitarist and primary lead vocalist of the rock band Kiss. Also known for his wailing vocals and high-energy on-stage antics. He is of Jewish and German ancestry, his mother was born in Berlin, Germany.